Mikhail Grigorev has prepared Unofficial Development Kit for Espressif ESP8266 based on GCC for Xtensa core and SDK from Espressif. 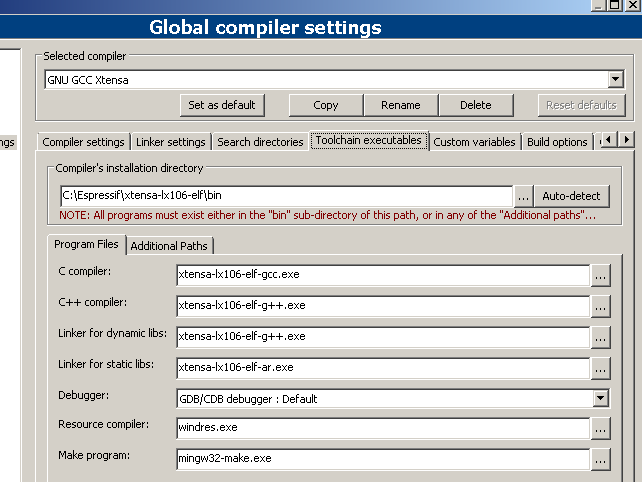 While recommended setup with Eclipse seems quite heavy to me same SDK can be used with Code::Blocks IDE. in project properties, "Project settings" tab check "This is a custom Makefile"
"Generic" Code::Blocks project - with simplest ESP8266 projects from SDK it would be enough to copy it to example project directory: ESP8266.cbp (with more complicated: adding source files to project and adding additional targets if they exist in makefile). Be aware that there are minor incompatibilities between SDK/DevKit versions that may result in build error when rebuilding with newer DevKit than tested. 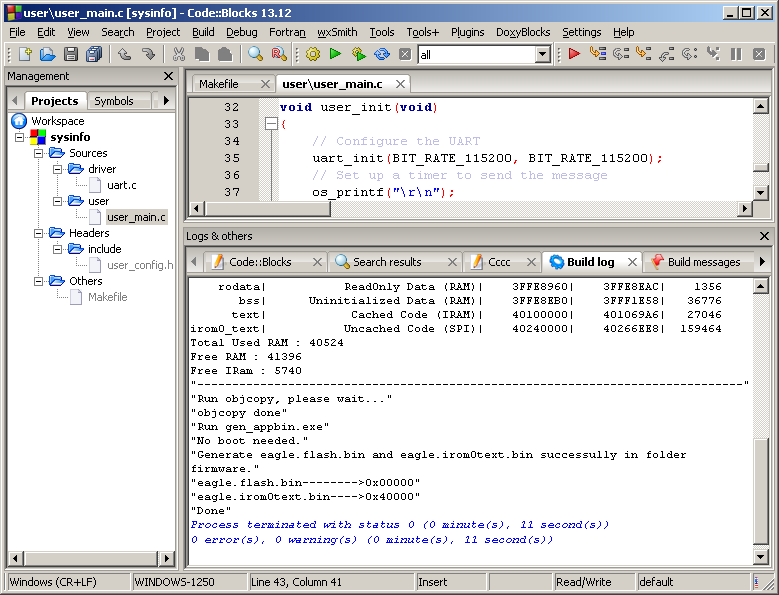 Here is "blinky" updated to work with SDK 2.0.9: blinky_sdk_2_0_9.zip. 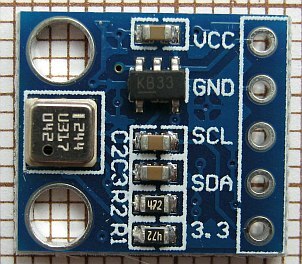 BMP180 - very cheap digital atmospheric pressure (and temperature) sensor, successor of BMP085. 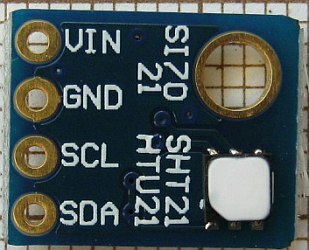 Working with similar to ESP8266 voltage range (1.8V-3.6V), connected with I2C. 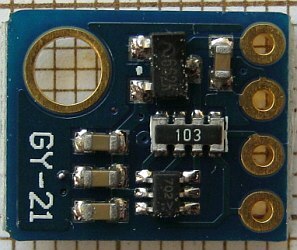 DIP-ready modules with MIC5205 voltage regulator and pull-up resistors are priced at ~$1.50. 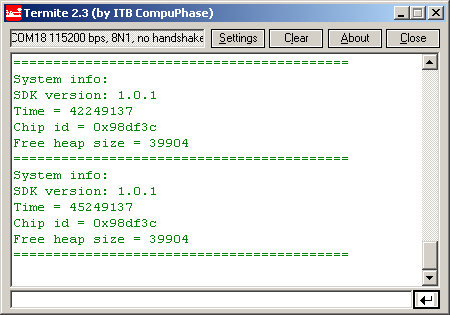 i2c_bmp180_ck.7z: same application but with makefile swapped from another project. This makefile is using esptool-ck for flashing and using additional UART converter lines to control ESP8266 reset and GPIO0 (RTS controls RESET or CH_PD, DTR controls GPIO0) thus allowing automatical switching to bootloader mode when starting programming. 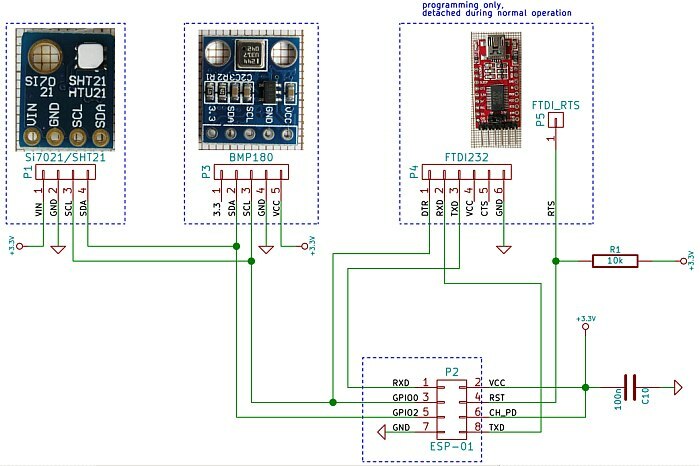 Cheap UART converters based on FT232RL (or quite probably its clone) seem to be good choice for programming interface as they have switchable UART voltage levels (5V, 3.3V needed for ESP8266, even more with external regulators) and all FTDI pins broken out. 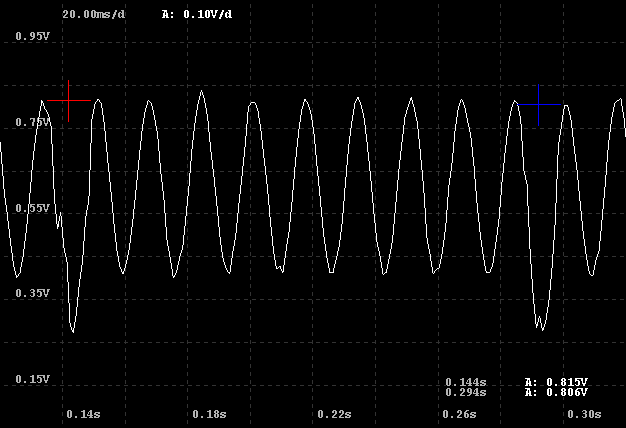 Note: if you have to use 5V UART connect ESP8266 TX directly to UART RX and connect UART TX to EXP8266 using voltage diviver - 2k2 resistor in series and 4k7 to GND seem to do the job. Configuration (user_config.h) needed: WiFi network name and password, http host and script name. As you can see above passed POST parameter is named "s". Yet another iteration of my "web thermometer" project. Definitely cheapest and easiest to assemble so far, but also easiest to write software for - ESP8266 SDK is easier to setup than e.g. MPLAB+C18 and there are tons of examples of ESP8266 usage for similar purposes. ADC pin (TOUT, pin #6) is not directly available on ESP01 module (unlike the ESP07 or ESP12), but with some care piece of kynar wire can be soldered directly to the chip.